As I write this, somebody on the far side of the planet is looking up into the evening sky. And as they look at the stars, a light falls on their eyes that came from the Andromeda Galaxy six million light years away. Perhaps they know what they are seeing but probably they are not even aware of it. Why single out the Andromeda Galaxy from all the other things that are in the sky? Because it is the thing furthest away that can be seen with the naked eye. That light started its journey before there were humans to see it. In fact it was just half way here when the Australopithecus nicknamed “Lucy” walked the Earth. All of human existence has happened while the light was within the quarter million light years of the Milky Way’s dwarf satellite galaxies and it didn’t get to the edge of our galaxy until William the Conquer met King Harold at the Battle of Hastings.... and the 235 years of US history? It is hardly noticeable, just an instant before the photons crash onto the observer’s retina. Did the person notice them? It would seem a shame for the light to have come all that way not to have been seen. So I wonder, who will witness the light? And having seen it, who will remember that light as it recedes in time at the speed with which it arrived. 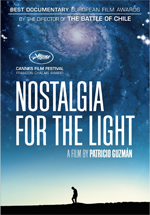 This is the message I take away from director Patricio Guzmán’s Nostalgia for the Light. Time is distance and for Guzmán, the distance between him and the years Chile was under the dictatorial rule of General Pinochet is growing out to the dark edge of memory. Starting with a coup d’état in 1973, over 2,200 people in Chile were “disappeared” and another 80,000 detained and 30,000 tortured by the Pinochet regime and its army. Pinochet stepped down in 1990 and though he was eventually charged with human rights violations and other crimes, he died in 2006 without ever having faced any of those charges in court. After the coup, Chile’s economy was privatized and internationalized which resulted in an apparent booming economy with (not surprisingly) increased economic inequality. And for 30 years no one in Chile dared speak of that time. It is into that dark forgetfulness that Guzmán peers along with the aging family members of the disappeared who continue to search the high barren Atacama Desert for the remains of their loved ones. The Atacama Desert is perhaps one of the most inhospitable places on earth. It is 10,000 ft high and it can go years without seeing a drop of rain. Curiously, this harsh dry environment also makes the Atacama Desert perhaps the most ideal place on earth to set up a telescope and everyone it seems is doing it these days. It is at this arid intersection of the disappeared and astronomy that Guzmán has centered his masterfully poetic film Nostalgia for the Light. Just as the astronomers search through stars as numerous as grains of sand, so the fragments of bones from the disappeared are found in the sand by those who have not forgotten them. Both searchers are looking back in time at fast-receding points of literal and figurative light. Looking at the stars and the bones is both grand and melancholic, eternal and impermanent, intimate and impersonal. Guzmán’s internal fires are still stoked by the Pinochet years but I felt like there is also a sense that compared to the billions of stars and the immensity of the universe, all the pain and injustice that he has seen is trivial and will pass from sight and then from memory. So you do what you can. Perhaps make another film; expand the audience’s horizon and hopefully keep the memory alive a bit longer. This is some of the most beautiful cinematography I’ve ever seen. Guzmán is painting a grand canvas with light whether it is an immense stellar void, a handful of sand or the swirl of dust motes like tiny galaxies. His scale is not of size but of wonder and the one common denominator is the shared humanity of the people on camera. As I write this, light is leaving the Andromada Galaxy and headed our way. By the time it gets to the Earth 6 million years from now, there will be no more humans. We will have destroyed ourselves or evolved into something else. But the light will still come and I wonder who will witness that light? And having seen it, will they remember it? The movie, of course, has stunning photography. Some is stock Hubble imagery but most is Guzmán finding beauty in a simple living room or on a desert mountaintop covered with observatories. Even the talking heads are personable and Guzmán makes me think that these are people I’d like to meet. The sound track and music are as good as the visuals. You might want to brush up on the history of Chile and the Pinochet years. Or watch Guzmán’s Battle of Chile to get a better understanding of the underlying drama of the disappeared and their families.